Leamington Spa Train Station chose Ryemead as their commercial window cleaning company of choice because of our meticulous planning and approach to the challenging access issues. In addition our health & safety record was key to manage safety of public located close to the site. A lack of water in the vicinity and our ability to ship to site, combined with specialist cleaning teams, advanced equipment, and ISO 9000 certification secured our selection. The 1939 Leamington Spa Station is a grade II listed building built in the Art Deco style which is faced with Portland stone above a polished granite plinth, which while impressive to look at presented access challenges for cleaning. This very limited access meant that the top side glazing now had a heavy build up of grime, dirt and algae. 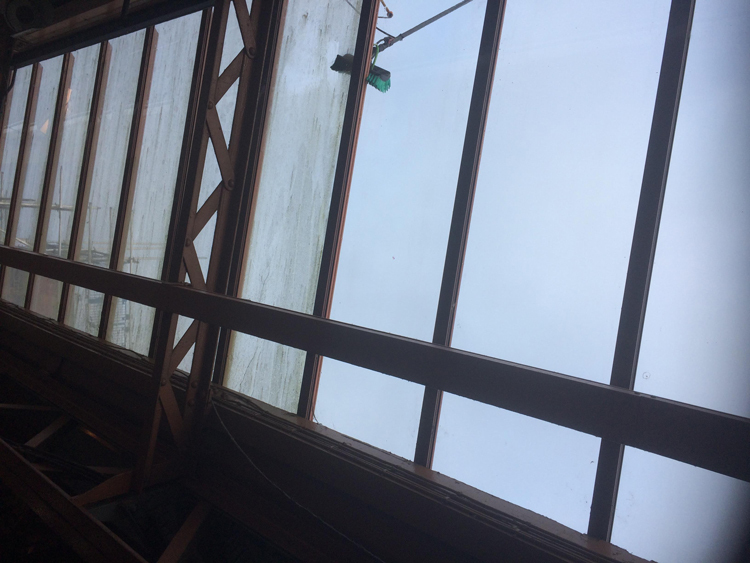 During our work carrying out commercial window cleaning at Leamington Spa train station we found a number of access challenges. The buildings design of flat roofs with parapet, wooden sashes with stone architraves, canopies and steel girders with cast iron columns are stunning to look at but inaccessible using standard cleaning platforms and equipment. 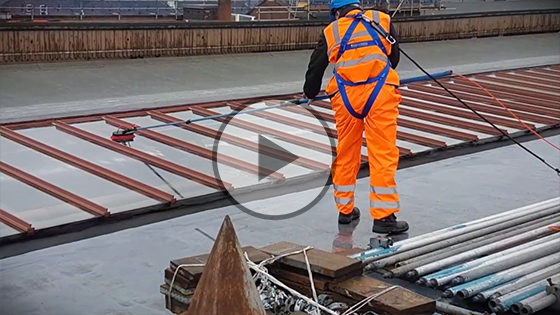 Lanyard Scaling: Ryemead personnel utilising full safety harness and lanyard equipment, connected to the mansafe latchway system located on the roof areas to gain access for cleaning. Our team used all of their experience to access the right areas while ensuring safely at all times. Limited Access: All equipment had to be safely transported onto the roof areas and van mounted hot water cleaning machines had to be maneuvered into specific locations. No Water Available: We used 200 metres of specialist hose to transport our cleaning water to specific areas on site, due to the limited vehicle access points and external water points. 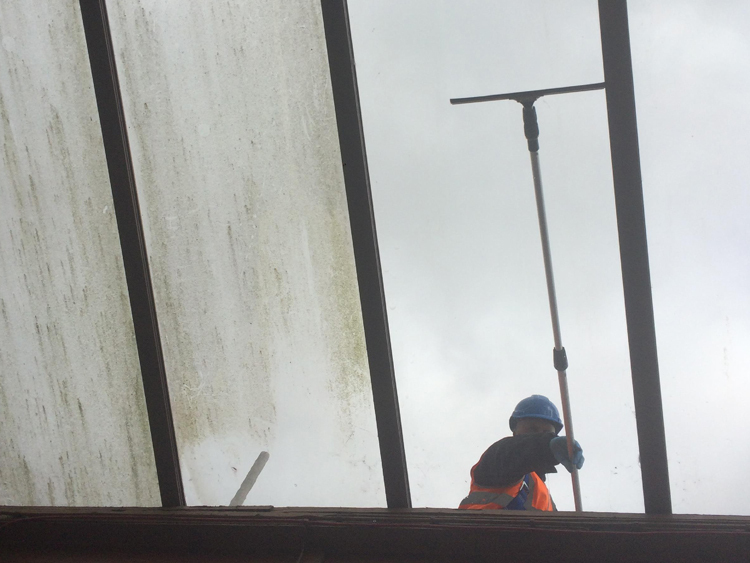 Our commercial window cleaning at Leamington Spa train station works took place on consecutive Sundays, ensuring the station was not at full capacity. A banksman carefully monitored the platform areas below to ensure cleaning was safe and all passengers and staff were fully protected. All areas directly below the cleaning process were cordoned off using barriers and security tape to ensure public safety. Why Leamington Spa Chose Ryemead? Leamington Spa were used to the challenges posed by the buildings architecture and knew that the limitations imposed by access and water supply deterred cleaning companies. Ryemead however, demonstrated railway station cleaning expertise and showed how we delivered station cleaning services that are second to none. We were able to demonstrate our appreciation of the complexities that this type of cleaning can present. The works had to be meticulously planned from start to finish due to major access issues, public in close vicinity, a lack of water supply and the level of dirt on glazing, all of which we had experienced and managed on previous projects. This experience and our planning and project management approach enabled Leamington Spa to select Ryemead for commercial window cleaning at Leamington Spa train station in the confidence that work could be completed efficiently, effectively and successfully.